A riveting new work from Susanna de Vries continuing astonishing stories of female bravery from Gallipoli to Kokoda. the brave deeds of women in war have long been overshadowed by male heroics. 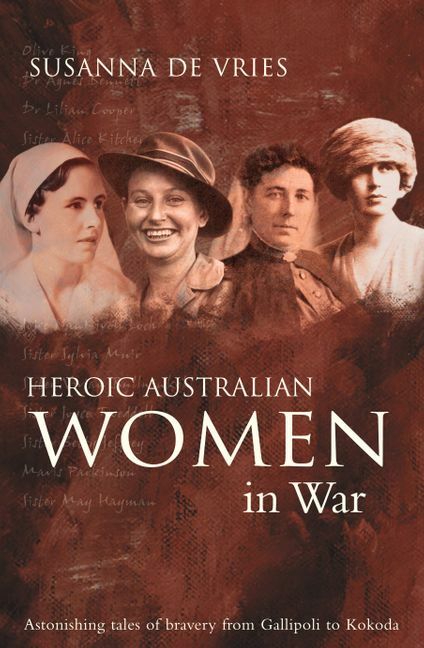 In this inspiring new book, renowned writer and historian Susanna de Vries profiles the grit, determination and selflessness of 11 outstanding Australian women serving in two World Wars: from Olive King, volunteer ambulance driver who saved countless lives in France and Serbia during World War I, to Vivian Bullwinkel, Joyce twedell and Sylvia Muir, all three of whom endured years of starvation and cruelty on Bangka Island at the hands of their Japanese captors. Other women featured include Sister Alice Kitchen, Dr Agnes Bennett, Dr Lilian Cooper, Louise Mack, Joice Nankivell Loch, Mavis Parkinson and Sister May Hayman. these are all women who deserve to be known, recognised and celebrated alongside their male peers. In her informal, vivid style, de Vries focuses not only on the astounding courage these women displayed in battle, but also on their personal struggles and accomplishments - proving that they were each as influential and heroic in life as they were in war. Susanna de Vries is the author more than 15 books, most about women in history, including Desert Queen: The Many Lives and Loves of Daisy Bates, Great Pioneer Women of the Outback, Heroic Australian Women in War and To Hell and Back. Her book Blue Ribbons, Bitter Bread: The Life of Joice NanKivell Loch, an acclaimed biography of Australia's most decorated woman, won Ireland's Sligo Non-fiction Prize and was short-listed for the Queensland Premier's Non-Fiction Award. An art historian by training, Susanna was made a Member of the order of Australia in 1996 for services to art and literature.